First of all, I would like to welcome you to the inaugural review posting on Music and Wines. WOO HOO!!! I will try and post at least one review every week with the hopes of doing more. Bear in mind, I am a web rookie, but my passion for Music and Wine will keep you coming back! I found this hidden gem at my local wine shop (LCBO) by accident. It was the bottle and the region it came from that drew me to this wine. 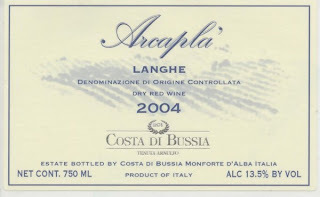 To begin, Costa di Bussia lange Barbera Arcapla’ comes from the Piemonte region of Italy (more specifically Langhe). I have always enjoyed a bottle from the Langhe appellation, so I had to pick up this bottle. After some research, I found that this wine was a true hidden gem. It has won a silver medal at the Mondus Vini competition in 2008 and was blend of two of my favorite grapes. This wine is a wonderful balance of fruit, tannin and acidity. The nose was a bit light, but the taste made up for it. It is a medium to full-bodied wine with a nice and long finish. I detected hints of berries (the dark kind), a bit of leather and a touch of espresso. 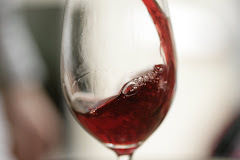 It was a really smooth wine that would be enjoyed by new wine lovers getting used to red wine and old time aficionados who love a full-bodied experience. This wine could be enjoyed alone, or with foods such as pasta, pizza, sausage and chicken. Please note, this wine may be impossible to find. Good luck, it is worth the internet hunt! I am sure there’s a lot of you who have never heard of Cut Copy. I am about to change that as this band is a lot of fun and full of energy. Cut Copy comes from Melbourne, Australia and started up in 2001. (released in 2008 by Modular Interscope). bit of Depeche Mode, The Cure and New Order. just right with a wide range of mellow and fun beats. over I usually listen to it again. the new listener will find an amazing new band to follow.